The relationship between forests and development is complex. It is often said that more than one billion of the world’s poorest people rely on forests for their livelihoods. But while people in poverty often rely on forests, we cannot assume that forests will help lift these people out of poverty. Three areas need further consideration in order to improve understanding of this relationship: better valuation of the non-cash benefits of forests, how forests contribute to other sectors and the differing impacts on different groups of alternative options for forest use. Up until now, REDD+ has remained firmly in the hands of forest and environment actors. However after Doha, there is no doubt that REDD+ needs to move away from being an issue solely for the ‘forests’ sector. We have a paradigm shift towards a mindset where forests are considered as part of landscapes more generally. But could this mean that forests lose prominence? The three points highlighted here – finding an agenda with weight, addressing technical issues, and adequately resourcing coordination – offer some fundamental stepping stones towards this objective. Read the full blog written by Will McFarland, published by ODI, here. On paper, the outcomes on REDD+ from Doha hardly set your pulse racing. For the first time, there was no REDD+ agreement on methodologies from SBSTA – with the major sticking point being whether or not there is international independent verification of REDD+ actions, while the REDD+ finance discussions agreed little more than to keep talking next year. Much of the commentary since Doha has focused on the lack of progress in REDD+, with calls that the “honeymoon period is over”, in stark contrast to the days when REDD+ was viewed as the darling of the negotiations. In reality, the lack of progress in the REDD+ negotiations is a symptom of the wider politics of the climate change negotiations. As Bas Clabbers, REDD+ negotiator for the Netherlands tweeted, progress on REDD+ depends on overall progress – and “REDD+ is a minor issue in the endgame”. So does this spell concern for efforts to tackle emissions from forests? Not necessarily. In contrast to the limp state of the negotiations, many countries – both developed and developing – are still committed to delivering REDD+. As the Doha negotiations took place, news broke of Norway depositing a further $180 million into Brazil’s Amazon fund in response to a drop in Brazil’s deforestation for the third year running; while the UK, Norway, US, Germany and Australia issued a joint statement reaffirming their commitment to working together to achieve REDD+. On a panel at a side event organised by the Union of Concerned Scientists focused on achieving development and addressing the drivers of deforestation, we were asked whether the various efforts were enough (with a tone that indicated they didn’t think it was enough!). While the other panellists answered, I racked my brains to think of something positive to say – and had to accept that of course they’re not. While global deforestation rates are declining and there are examples of progress as a response to government, private sector and civil society interventions, the pace of this progress does not live up to the urgency or scale of the issue. But at the same time, there are interesting developments that offer me more hope and confidence about the direction that REDD+ is taking. Over the past couple of years, there has been increasing recognition of the need to focus on the drivers of deforestation to deliver REDD+ and, with that, recognition that this means looking beyond the “forest sector” to consider forests as part of a wider landscape (as can be seen in the shift from CIFOR’s forests day to the future focus on landscapes). And this shift in thinking reflects the paradigm shift needed in countries to deliver REDD+. Rather than a discrete project with clear boundaries, REDD+ requires a change in mindset about the role of forests and wider land use to meet development needs and achieve environmental sustainability. This means finding ways to strengthen coordination between different sectors – as was the focus of a recent paper by ODI “Unlocking progress on REDD+: sector coordination in Uganda”. There needs to be the involvement not only of government actors, vital for their role in putting in place, and enforcing, the necessary enabling environment to incentivise change, but also private sector actors that need to and can drive change through their own actions and investments. So, where does this leave the UNFCCC negotiations on REDD+ going forward? The nature of the process means that it is unlikely to be the sort of dynamic and inclusive table at which to bring together all these actors and achieve progress. But this doesn’t mean there’s no role for the UNFCCC to play. Securing long-term finance to support REDD+ efforts is vital to provide an adequate incentive for developing countries to continue to take action. But this is too big a mouthful for the REDD+ negotiators to bite off. Instead it relies on progress in the wider negotiations and without this the REDD+ negotiators will continue to stumble over political pitfalls that hold up progress on issues that appear to be purely technical. As they again turn their attention to the drivers of deforestation in 2013, giving a signal that all actors should work to address the drivers of deforestation – including international drivers – would provide a stimulus for ongoing action around the negotiations. Just as forests need to be considered within their wider landscape, the UNFCCC discussions on REDD+ are part of a wider landscape of action that collectively needs to drive progress on tackling forest emissions. This is the fourth in a series of guest contributions focussed on sharing local experiences from around the world in developing and implementing safeguards in REDD+. The series features contributions from Central America, East Africa and Asia-Pacific. In this blog Luis Trevejo explores how experiences from the Model Forests in Latin America can be used to help debate on safeguards in REDD+ and how the two initiatives can work towards the same goals. The Model Forests are large-scale partnerships that serve as platforms for cooperation among diverse actors with the aim of promoting effective participation in sustainable management of an area’s natural resources. Latin America has 19 Model Forests across 11 countries, with over than 25.5 million hectares and 3.5 million people involved. With broad objectives that encompass poverty reduction and combating desertification, Model Forests have emerged as a major regional platform to face up to the challenges of climate change and its consequences, including delivering global REDD+ objectives. It is important to evaluate the effectiveness of the Model Forest structure in the context of REDD+, whose safeguards principles and criteria (to ensure effective participation, respect local knowledge and indigenous rights, conserve biodiversity and ecosystem services, promote social and environmental benefits) must be contributed to by multiple actors working at different scales – a principle condition of the model forests. Indeed the network of organisations involved in the region’s Model Forests is already taking the initiative to ensure Model Forests build safeguards and ensure effectiveness. Back in November 2011 in Santa Cruz de la Sierra, Bolivia, a regional dialogue was organised to this effect – Model Forests and local implementation of national strategies for REDD+ in the Latin American region“. This event built a foundation in the region for dialogue between Model Forests. It also focused attention on enabling frameworks that streamline REDD+ processes with existing regional alliances, actions to address REDD+ obstacles and training needs, research, opportunities for collaboration and processes to improve the region’s institutions. From this point originated a number of principles that the region is working on in order to ensure that REDD+ process fit into the existing institutional landscape, build on existing efforts to support sustainable forest management, and strengthen the participation of a broad base of stakeholders in delivering against the safeguard principles. Training is necessary to strengthen concepts and simplify the REDD+ basic terminology, develop friendly training materials, considering mixed knowledge of the different actors throughout the Model Forests, improve relations within and between Model Forest territories as well as strengthen leaders and actors in business and other specific REDD+ aspects (like governance, development and project management, monitoring, evaluation, negotiation). In the ​​research area it is necessary to increase knowledge about governance and environmental, social and economic baselines of the populations involved. The construction of tools to measure key aspects in the monitoring, review and verification of REDD+ and the systematisation of experiences related to reducing degradation and deforestation without economic incentive schemes. Institutional processes need to involve the territories where the Model Forests can function as models for REDD+ experiences with action on ensuring safeguards are met. Also, to standardise and to unify the language ​​in this platform to strengthen and build more partnerships at different scales, creating common proposals to influence decision-makers and improve the dialogue with the community and local populations. In terms of collaboration opportunities it is necessary to promote exchanges of experiences within and among Model Forests, strengthen the youth groups, improve the communication among actors at different scales, establish collaborative agreements and funds for financing sustainable activities, create common platforms to address markets and, finally, to promote a regional dialogue to allow the discussion of issues that go beyond context aspects. No doubt, the Model Forests network across Latin America will have to undertake major tasks in the coming years. Regan Suzuki highlights key points from a new RECOFTC publication that explores the potential links between climate change adaptation and mitigation. The women proudly show off the now verdant forest surrounding the Chapini River. 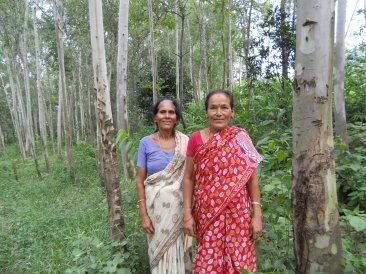 As one of the few female-led community forestry user groups (CFUGs) in this conservative area of Nepal close to the Indian border, they represent a success story. They also offer valuable insights into the poorly explored intersection between climate change adaptation and mitigation. The Bishnupur community began planting trees and supporting natural reforestation alongside the river in response to flooding, a phenomenon that Nepal can expect more of as climate induced glacial outbursts increase. Not only were their property and homes buffered from flooding, they began to observe a range of other benefits: improved water retention in areas adjacent to the forests; the community, and specifically the women, had their rights to the forest formally recognized; and finally, even district forest officials acknowledged the significant increases in carbon sequestration. Until recently, climate change adaptation and mitigation have often been treated as two separate and independent approaches. The study of, funding pots and international discussions on each have taken place largely in isolation. Not only is this ineffective, it is potentially counterproductive. In a just-released publication, “Linking Adaptation and Mitigation through Community Forestry: Case Studies from Asia,” by RECOFTC and its partners (CDKN, REDD-net, Raks Thai and the Adaptation Knowledge Platform), authors argue that it is imperative for the two actions to be integrated. The case studies, covering five countries: Cambodia, Indonesia, Nepal, Thailand and Vietnam), illustrate that there is significant potential for synergies between mitigation activities such as reducing rates of deforestation and supporting adaptive capacities of rural communities (i.e. forest-based sources of livelihoods, strengthening food security and investing in agriculture-supporting ecosystems). But the links are not automatically mutually enhancing. Trade-offs exist and must be incorporated and addressed in project design. The case studies, while still an early step in teasing out the inter-relationships between adaptation and mitigation, point to concrete examples of where real-life synergies and trade-offs are appearing. In Ban Huay Win, Thailand, for a community located within a national park, conservation-oriented restrictions on land-use prevent community members from adopting potentially more sustainable long-term land management strategies. At the same time, however, the innovative introduction of improved agricultural practices, such as terracing, by NGOs has reduced some of the pressure on forestland, allowing, in some cases, for fallow land to be returned to natural forest regeneration. In the initial example of the Bishnupur community forest, as forest management plans develop, efforts to conserve forest are sometimes at the expense of vulnerable groups. Restrictions on the free grazing of cattle in the forest means that the burden of collecting fodder for stall-raised cattle and the loss of income from dairy as livestock numbers decline fall squarely on women. Unlike at international levels, the cases underscore that at community levels the distinction between adaptation and mitigation actions is often blurred. The main argument for community forestry, in the context of climate change, is that it responds to multiple interests. Forests, and in particular community forestry, represent a bundle of assets and benefits. They serve as a safety net in times of hardship and support critical ecosystems required for well-being. The cases point out that while the contributions of community forestry to mitigation are well-recognized, in the case of adaptation, community forestry is equally well placed to support adaptive capacity, but this is not automatic. A people-centered approach is required in order to ensure that mitigation or conservation goals are not pursued at the expense of local livelihoods. While community forestry does not inherently ensure improved resilience to climate change, if strategically mainstreamed within community forestry frameworks, it could be a highly effective approach for doing so. Regan Suzuki is a Project Officer at RECOFTC – The Center for People and Forests and Coordinator for REDD-Net Asia-Pacific. This is the third in a series of guest contributions focussed on sharing local experiences from around the world in developing and implementing safeguards in REDD+. The series features contributions from Central America, East Africa and Asia-Pacific. In this blog Marlea Muñez highlights the gaps between safeguards policy and practice and the complexities of who should be responsible for implementing them properly. In a country like the Philippines, where the present government leadership talks about serving the people as the their ‘boss’ and running a transparent government, matters like ‘safeguards’ should mean something, but there is also plenty of reason to believe they might also be undermined. It was in December 2010 in Cancun that the Philippines introduced the Philippine National REDD-Plus Strategy (PNRPS), and has been referring to ‘REDD-plus beyond carbon’ – with social, community, biodiversity and governance aspects of REDD-plus as equally important as the carbon objectives. From there, the critical engagement with CSOs through CoDe REDD Philippines and the department of environment and natural resources (DENR), through the Forest Management Bureau, further developed – from drafting the PNRPS to coming up with corresponding policy measures and demonstration activities on REDD+. The PNRPS clearly stated that safeguards means ensuring that REDD-plus policies and projects protect the rights of Indigenous Peoples and local communities, and that these peoples will have meaningful engagement in designing and implementing REDD-plus. While these national aspirations go further than the international commitments described in the Long Term Cooperative Action text under UNFCCC, the Philippines faces tough challenges in translating these ambitions into actions. It is easier said than done as they say. Recognised as an established democracy, the Philippines shifted its emphasis of forest management policy from a government-corporate run scheme to community-based forest management (CBFM) in 1995. With collaborative working established between government and non-government organisations, the Philippines formulated the Philippine CBFM Strategic Plan for 2008-2017, to support sustainable forest management (SFM), which substantially fed into the PNRPS. Hence, chronologically, the CBFM Strategic Plan and PNRPS indicated 2017 as having set up the CBFM in full swing, thus opportune time for the local community engagement phase of the PNRPS. Will this happen at all? I am afraid not with the current conditions. The government budget allocated for CBFM was never adequate, and yet was substantially reduced between 2008 and 2011. Then in February 2011, without consultation with CBFM communities or Indigenous Peoples, an indefinite moratorium on cutting and harvesting of timber in natural and residual forests was imposed, a repetition of an event in 2004. Following the 2004 moratorium there was a unilateral cancelation of all community-based forest management agreements, prompting the CBFM peoples’ organisations to appeal – having invested time and resources into the forests they were now deprived of the opportunity to bring in income and support their livelihoods. DENR responded to the appeals but unfortunately missed the point that there should be consistency with policies and implementation. All cutting permits now have to be submitted to the central office of DENR for clearance! This is despite the fact that there are community plans duly approved by DENR in the first place. The 2011 moratorium was followed by announcement of the National Greening Program (NGP), implementation of which started with complete disregard to previous reforestation programs implemented in the country. Forest dependent communities were automatically excluded since their lack of ’legal personality’ was taken against them. How could they sustain their legal personalities if CBFM has not been actually fully supported? When clarifications were sought on the moratorium, DENR originally explained that trees planted by communities will be allowed to be harvested. However, only this April, they suspended the processing of all requests for cutting permits until further notice and reiterated the February moratorium. On NGP, DENR expressed a desire to revise their guidelines, a very costly exercise when in fact lessons were already known from previous reforestation programs. Whether communities will be consulted on the new guidelines is yet to be seen. These are only some examples of conflicting policies within the forestry sector that undermine safeguards, and subsequently sustainable development. These issues are mirrored in the mining sector, allowed in practically all areas in the country. Yes, there was a set of guidelines on free and prior informed consent (FPIC), revised recently, but the million-dollar-question is whether the communities are provided with adequate support to fully engage in the FPIC process and whether the facilitators of such processes are fully equipped with the skills and knowledge needed. The fact that mining operations are currently happening in prohibited areas shows how such activities easily sit outside of the laws, let alone guidelines and policy recommendations. In an effort to react to these concerns on mining, the government has just issued a new Executive Order on mining which may appear to have expressed control on where mining operations should be, but undermines local governance and processes. Governance-wise, two major national agencies of government, DENR and the National Commission on Indigenous Peoples (NCIP) are overseeing forestlands and ancestral domains where the remaining forests are. DENR under its mandate has the CBFM Strategy and the National Integrated Protected Areas System Act (NIPAS). NCIP is responsible for the Indigenous Peoples Rights Act (IPRA). In addition Philippines has local government units with specific powers relating to education, health, water supply and some natural resources management. Given these, REDD-plus related policy studies have been initiated by DENR/BMU-GIZ project and CoDe REDD Philippines, namely: Analysis of Forest Policy, Clarifying Carbon Rights, Assessment of FPIC implementation and Analysis of Key Drivers of Deforestation and Forest Degradation. The UN-REDD Programme will also support the drafting of the REDD-plus Safeguards framework and guidelines. With this, will the Philippines be able to come up with its REDD-plus Safeguards framework and guidelines? Again, I am afraid not under the current conditions. It is obvious that Philippines has more than enough laws and guidelines in place. These BMU-GIZ policy studies, though not yet published, have actually already informed REDD-plus readiness phases in the country. Readiness projects are in place and there could be more. What is wrong then? How can safeguards be put on the table? Maybe, there is lack of coherence and connectivity in various undertakings and primarily, there is a need for leadership in the environment and natural resource sector. The Rio+20 UN Conference on Sustainable Development pledged a renewed focus on sustainability challenges. By using a holistic framework that addresses economic, social and environment aspects of sustainability, it hoped to rekindle the essence of sustainable development that was a key part of the success of the 1992 Earth Summit. But you wouldn’t know that from The Future We Want, the final outcomes document from the global summit. You only need to look at the coverage of forests to see that Rio+20 fell short of finding a way to talk about the complexities of ecosystems and shift how the natural world is valued. Forests are emblematic of natural capital. Over 1 billion of the world’s poorest people’s livelihoods depend on forests and they support rich biodiversity. Without a strong focus on forest ecosystems, we will not be able to find solutions to climate change, food security or better equity in the north-south divide. But the Rio+20 text does not do justice to their critical role. Forests were given four paragraphs in The Future We Want. The first paragraph includes a list of themes that would make forest advocates proud, from stopping forest loss and degradation to supporting the local communities. But it’s largely reaffirming previous statements and agreement. The only call for action is an ‘urgent implementation of the Nonlegally Binding Instrument on all Types of Forests’, a document that was adopted in 2007 by the UN General Assembly and has yet to be implemented. The text says the right things, things that are difficult to disagree with, but fails to take the step to turn that into practical action. The seeds of change entered at the proposal stage and never emerged in text form. Two timeframes were removed from the text during negotiations, as is clear from the draft dated 2 June 2012. One was a commitment ‘by 2020, to strengthen forest governance frameworks and achieve sustainable forest management’; the other was to halt ‘global forest cover loss by 2030 at the latest.’ But, as is the case with many multilateral processes, the host country was keen to reach some agreement between the hundreds of interests present, and Brazil opted to remove all proposals from the text that had not yet been universally agreed or resolved. Consequently, progress was extremely limited and forest governance wasn’t adequately addressed. While the text refers to the importance of ‘cross-sectoral and cross-institutional policies’, governments failed to make these links in the outcome document as forests barely receive a mention in other parts of the outcome document. For example, while 40 percent of the global population depend on biomass for their energy needs, a figure that is expected to increase with the world’s population, there is no mention of forests in the section on energy. The outcomes document doesn’t completely ignore the role economics could play in action for the forests, stressing ‘the importance of integrating sustainable forest management objectives and practices into the mainstream of economic policy and decision-making’. But as with other sections, the enforcement mechanism relies on old ideas– not forward-thinking that could render a paradigm shift. 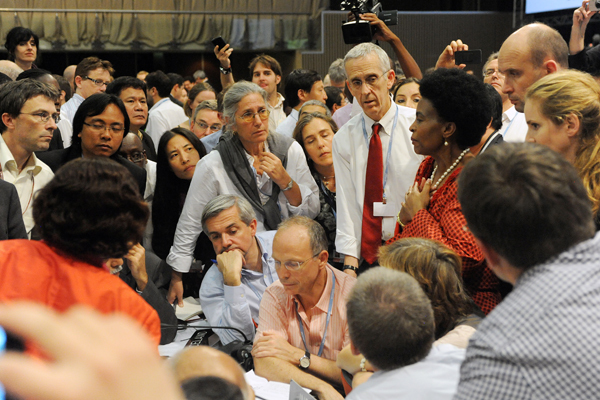 In an effort to connect the multilateral process with civil society, Rio+20 employed a technique never before utilised. It opened proposals up to a public vote. In the days leading up to the summit, organisers held a series of dialogues, each focusing on a different topic, in which a panel discussed proposals. On the dialogue about the economic bases of sustainable development, over half the votes cast were for two proposals: one to include environmental damage in the calculation of GDP, the other to remove the economic invisibility of nature. It represented a demand from the people for the economic sector to better understand its effects on the world’s ecosystems. But the dialogues were held the week of the summit, and there was no chance leaders would incorporate suggestions into the carefully crafted final outcome document. Some environmentalists recoil at the idea of calling forests ‘capital’. They worry that language commodifying forests will result in corporations treating ecosystems like warehouses, reducing them to a line on finance sheets. But in many ways forests are already commodified, with the price of timber they hold or the land they’re on. Although economic terms perhaps should not be the only measure of the value of forests, there will be no solutions unless we find common terms to talk to business. The multilateral process let us down by not creating that mechanism. We hoped Rio+20 would break through the progress made in the 1992 Earth Summit; instead, it doesn’t appear to have got us far. After decades of negotiations and effort, practical action against deforestation is still stalled by competing interests. In the following decades, it is predicted that the global population will balloon to 9 billion people and global consumption will quadruple. The only way we could accommodate the increase is if we learn how to develop without mining resources from the forest in unsustainable ways. And the first step is to find language to cut across the cross-sectoral. If we don’t change course, we are doomed to end up where we are headed. This is the second in a series of guest contributions focussed on sharing local experiences from around the world in developing and implementing safeguards in REDD+. The series will feature contributions from Central America, East Africa and Asia-Pacific. In this blog Promode Kant discusses the problems with expecting carbon investments to solve gender and social equity issues. There is something in the dry desert air that ensures traditions rule; women should remain unborn, and those who still dare arrive should rejoice in being unseen and unheard. Time appears to pass by these harsh lands. It would perhaps take many more monsoons to soften traditions, just that tiny bit to let currents of change flow in. Sirsa, the driest district of Haryana in northern India, adjacent to the Thar desert, still awaits that flow of change. So when the first CDM forestry project was initiated in India way back in 2007 in the sand dunes of Sirsa, it was a challenge to marry equity with carbon credits. The CDM rules insist on equity as a central principle around which the project is established. The participation of all concerned in the project has to be truly voluntary and every single project activity should pass the test of ‘no injury’ to the interests of non-participants. And it must result in positive impact on women and socially and economically weaker sections of the local populace. A legal Society was set up to create and manage the CDM project and any adult person of the area willing to contribute a minimum of 0.05 ha of land could become member of the Society. A total of 227 farmers contributed 370 ha of land for the project. Care was taken that participation was not denied to numerically or socially weaker castes and communities. The minimum land requirement was kept as low as meaningfully possible so that the poorer sections could take part, though, for obvious reasons, the landless could not be a part of the project. An important requirement of land eligibility was that it should be considered unsuitable for regularly raising agricultural crops, either on account of low productivity or difficulty in management. The second part – difficulty in management – was deliberately kept to accommodate widows, with no adult males in household, who were unable to manage their lands and to whom tree cultivation was a more attractive option. The voting rights in the management of Society were separated from shareholding which was based on the extent of land contributed for the project. This, it was reasoned, will allow poorer people to have the same decision making rights as richer ones who contributed most of the lands for the project. So what is the situation today three years after project activities began in 2009? The day to day management of the Society is in the hands of its executive body. The byelaws provide that if the executive committee did not have one third women members the government would nominate as many women as necessary from outside to bring their numbers to the requisite minimum. The implied threat has worked and there are always at least one third women among the executives. But the worst kept secret in the area is that all the women there are the wives of powerful men in the Society. This was not unexpected. Nobody really hoped things would change for women so easily here. But now more serious trouble is brewing for small farmers because the larger farmers now find other better earning opportunities for their lands and are quietly withdrawing from the project. When the project is due for carbon credit verification later this year there may be no option but to ask for the project to be re-evaluated, because the test of additionality and leakages is sacrosanct in CDM, and large changes in project boundaries can render calculations and checks done earlier meaningless. Small farmers do not realise it yet and the Forest Department expects the Society to deal with the problem judiciously – Society byelaws expressly prohibit withdrawing from the Project for the entire crediting period of twenty years. But the Society itself is controlled by the better off farmers, and their wives, who are unlikely to punish themselves. Has the CDM failed then? Maybe burdening CDM with too high expectations on equity is not a sound idea after all – a CDM project, even a large one, is too light an intervention in an area to change the nature of the local society and one may only be preparing grounds for its failure by insisting it does what it cannot. Inequity in a society sits in its heart, in its deep fissures, in its imbalances. It is kept in place by the greed of powerful and helplessness of the weak. It cannot be patched up with a sprinkling of carbon, even if it falls at the right places. Bringing equity in such a custom ridden society has a high cost. And this cost has to be borne by the larger society – the country government – through its governance policies. There is a limit beyond which it cannot be pushed on to private individuals who dare to take up a venture as risky as a CDM forestry project. For them it should suffice if they follow the laws honestly, in letter and in spirit. For more information on equity in REDD+, please visit the REDD-net website’s equity page. This is part of a series of guest contributions focussed on sharing local experiences from around the world in developing and implementing safeguards in REDD+. The series will feature contributions from Central America, East Africa and Asia-Pacific. In the this blog, Elena Florian and Raffaele Vignola discuss the impact of a ‘training the trainers’ course in indegenous territory in Costa Rica. Governments across the world are currently discussing the importance of designing and implementing policies that can contribute to reducing deforestation and forest degradation in order to conserve, maintain and enhance the carbon stocks present in the forests. We know forests are important because they have the ability to sequester carbon from the atmosphere, crucial for climate change mitigation, but they are also important because they provide goods and services important for human development and well-being. A good proportion of these forests are also found in indigenous territories: for example in Costa Rica, 10% of the forests are under indigenous control. In 2008 Costa Rica took the opportunity to use its national REDD+ strategy to strengthen its innovative national system of payments for environmental services. During the initial stages of the Readiness Preparation Plan, Costa Rica identified primary key stakeholders and organized a Strategic Social and Environmental Assessment workshop to discuss with them issues and risks that should be considered in the implementation of the REDD+ National Strategy. This initial workshop brought together 116 participants representing various sectors including government institutions, indigenous, agricultural and private organizations, national and International NGO’s and the academia. As a result of this workshop, representatives of 23 territories around the country identified the need to find a way to improve the dissemination of information to these indigenous groups and generate greater opportunities to influence government REDD+ decisions. Through this process came the suggestion to create ‘training for trainers’ programmes for cultural mediators. These would be participatory, in order to actively promote greater awareness and understanding of climate change issues, and to create interest in how participation and influence at a local, territorial and national level for REDD+ could create an important platform to begin wider discussion and negotiation with government representatives for better forest governance. This training program was initially implemented in the Talamanca region of Costa Rica as the first pilot site that targeted 8 different indigenous territories. Locally and culturally relevant training: training involves different modules on climate change issues and REDD+, including material which integrates indigenous beliefs about the universe and life in order to promote an understanding of natural resource management issues based on their own cultural and traditional knowledge. Participants are supported to develop different learning tools specific to their own territories. Scaling up and increasing outreach: Each local government nominated participants from their indigenous territories to participate in the week long course. At the end of the course, participants went on to implement two more workshops themselves in different indigenous territories. Community liason: This pool of newly trained cultural mediators now plays an important role disseminating information to local communities as part of the consultation process of REDD+, under the principle of free, prior, informed, consent (FPIC), and most crucially they will be important liasons to bring concerns from the communities up to policy makers in local, regional and national authorities. So, what how can we learn from this experience and what lessons are transferable across other regions? The representatives from indigenous communities have shown a high level of interest, desire and effort to participate in REDD+ processes. Forest dependant communities arond the world are likely to be open to high involvement in REDD+. REDD+ is an opportunity to bring important forest and rights issues to the discussion table, particularly those not addressed in the past, and local communities will see this as a benefit. Establishing open, participatory and inclusive mechanisms encourages local communities to take greater ownership over projects, greater interest in participation and builds momentum behind the process. There is a need to implement policies that recognise, promote and support the role of traditional knowledge in the management of natural resources that can be reflected in adaptation and mitigation climate change actions. If forest dependant communities are to be supported to effectively influence and engage with polocy makers, there is a need to continuously provide technical support that strengthens local capacities and participatory approaches.